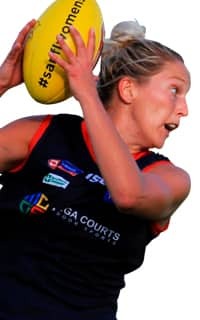 Tash Gunawardana interviewed former Adelaide United captain Marijana Rajcic who was selected at pick no.32 by the Adelaide Crows in the 2017 AFLW National Draft. Congratulations and good luck to Rajcic in her first season at the Crows this year. Why did you swap codes from women’s soccer to women’s Australian Rules football? It was something that came out of the blue really. I had not ever really thought about playing AFLW, until my best friend planted the seed in my head. The opportunity presented itself and I thought why not give it a crack. A new environment, new people and a new challenge. Do you think there will be other players from the W League who might swap codes like you and play in the AFLW? Yes for sure. We already have the likes of Bri Davey, Ellie Brush & of course Jenna McCormick who have made the switch to AFLW. But I know a number of girls who have made the switch and are currently playing SANFLW. But as AFLW continues to grow, I know girls will see what AFLW has to offer them and make the switch. For you, what has been the biggest change from playing women’s soccer to playing women’s Australian Rules football? The biggest change would have to be the shape of the ball haha. But also just how much ground there is to cover. The size of the oval compared to a soccer pitch is massive. So having to get more kilometres in my legs has probably been the biggest change. It was a very surreal feeling. It did not really sink in until preseason began. But you could not wipe the smile off my face that day. Describe what women’s Australian Rules football means to you? Who has been the player or players you have learnt the most from since being at the Adelaide Crows? Ooooooooo this is a tough question. There are so many players I could mention that if I started listing them, I am sure it would end up being the whole squad. But I have definitely been absorbing as much information as I can to help me develop and improve as fast as I possibly can. Hmmm. This is a tough one. But I cannot go past being chosen as Captain of Adelaide United. It was definitely a proud moment and an honour to lead that group of girls. As you were the captain of Adelaide United in the W League, what leadership skills can you bring to the Adelaide Crows? My positivity and communication skills. How do you prepare for a women’s Australian Rules football match and how do you recover after a women’s Australian Rules football match? Well since I have only played a handful of Aussie Rules games, preparing to play is not too different to soccer; but just making sure my muscles are feeling good; I am relaxed and focused & know my job. After a match, Recovery is vital. Ice baths is at the top of the list followed by wearing compression tights. What are you most looking forward to in your first season with the Adelaide Crows? I'm just looking forward to getting this season underway & playing some football with my family!!! Image above courtesy Adelaide Football Club.